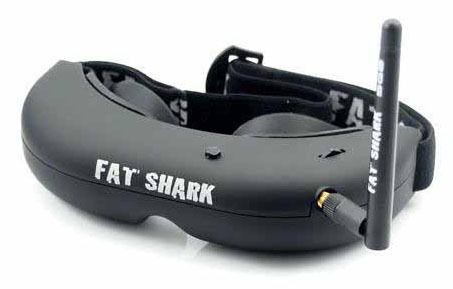 Attitude, already the best all round FPV headset in the Fat Shark lineup, has been supercharged with the addition of the revolutionary 3-axis Trinity head tracker. The 16bit, 9DFO 3-axis head tracker is nothing short of perfection that binds camera motion to head motion so accurately and smoothly that it creates the most convincing immersive FPV experience available. The 35 degree FOV display strikes a perfect balance between large screen immersion and compact pixel density clarity. The AttitudeV2 sports the same polarized backlight technology used in the gorgeous Dominator display for vibrant colors and has adjustable IPD for dialing in the optic sweet spot. The Attitude utilizes NexwaveRF technology with high pass filtering to make it impervious to 433Mhz and 2.4Ghz UHF radio interference. The quality extends to the exterior with its sleek ergonomics, rubberized texture shell, tactile motion IPD sliders and secured rubber eye cups, the AttitudeV2 headset looks and feels great from the inside out. To shorten your journey to FPV Nirvana, the AttitudeV2 bundle includes the high performance 600TVL FPV tuned CMOS camera for RTF out of the box (pan/tilt/roll mount not included). Note: Battery, charger, pan/tilt/roll mount and adjustable earphones are sold separately. stable earphones are sold separately. Notice: The use and operation of this product in the USA and many other countries requires an amateur/ham radio license, and some countries may forbid its use entirely. It is the responsibility of the purchaser to ensure that the use of this product meets the requirements imposed by your government’s rules and regulations for RF devices. Do not purchase this product if you are unsure of the government requirements or are not able to comply with them. RC-Drones cannot be held responsible for your actions if you purchase and/or use this product in violation of your government's regulations.